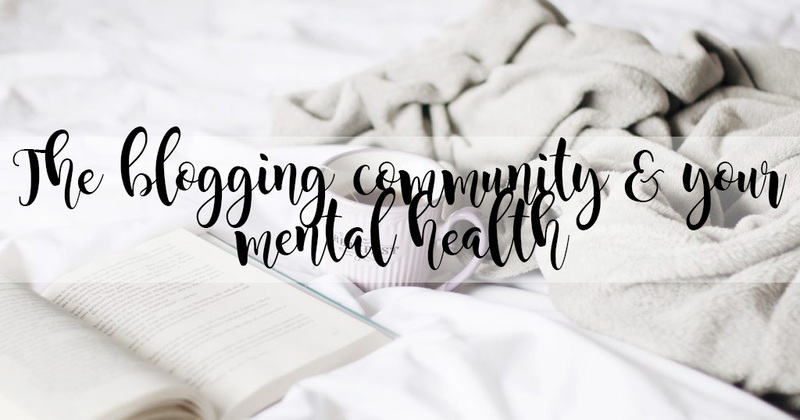 So I felt like today would be a perfect opportunity to speak about the blogging community and how it can improve your mental health of have a positive affect on it. However, in some cases the communiy can also have a negative impact on your mental health too. Mental Health is one of those things in life which can have such an impact on what you do on a daily basis. For me, some days I just want to cry and cry and cry until I have no tears left to come out. However, on other days I can feel absolutely incredible and nothing can bring me down. I have to say since joining the blogging community I have definitely had mixed emotions on how I feel about it. To begin with I felt down after I had joined in with a chat, no matter which chat I joined in with. I felt like I werent't good enough and no one would like me. It seems like the blogging community is this little circle of people which you either fit in, or you don't. I wouldn't say it's inclusive. Whereas, on other occasions I have felt great after a chat on twitter when I've spoken to lots of new people about the most random topics! I've definitely found a bunch of people who I can speak to if I'm feeling down and need someone or something to cheer me up. There are so many people within the blogging community, there will be someone or many people who have similar interests to you. This is blogging at the end of the day, and if you like beauty, there will be a heck load of people who like beauty too! It's finding the people who have other similar interest to you who you can also connect with. So many people are so welcoming! There are so so many people in the Blogging Community and I mean thousands but there will always be a bunch of welcoming people there waiting for you. Since joining the blogging community I have had so many people ask me if I'm okay if I'm feeling down and they're always their if I need someone to speak too. I have the people who are there if I need someone to have a laugh with or there's the ones who are great at giving advice, no matter what the subject is. The blogging community is there with their arms wide open and it's a surreal feeling being welcomed into such a big community by people who you do not even know. There are so so many chats on Twitter with a variety of topics! If you didn't know, there is a lot of twitter chats, and I mean a lot a lot. I was generally shocked at how many twitter chats there are and each day I'm sure there's another one created to add to the list. There are chats about Instagram, there are ones based on marketing and there are a heck load just for girls! However, you can also find the Inclusive blogger chats and then there's ones dedicated to the Mental Health Topic. No matter what topic you're looking for, there will be a blogger chat just about that on Twitter which is a great way of getting your name out there too! The community can seem clicky. I'm not sure if anyone else has thought this but the blogging community can seem rather clicky. You have them groups of people who are a circle of close friends and although you may get along with every person in that circle, you still feel like you're not accepted. This unfortunately has had a negative impact on my mental health and sometimes I do think "What's the point? ", but then I'd be letting someone get to me, which is a goal of mine not to do! So hey ho, it happens, it's life, but it is a blogging community struggle unfortunately. The feeling of being pushed out. This is very similar to the point above, but you can also feel quite pushed out in some cases when joining in with a twitter chat within the blogging community. Recently I was joining in with a chat, and what ever I answered, this one person basically slated me for my comment which really wasn't nice and to be honest, her comments were quite harsh too. I haven't partcipated in this chat since because I didn't feel accepted and I found it rather uncomfortable joining in. Staying up way too late to get involved. Last but not least, I'm guilty of staying up past the time I usually go to sleep just so I can join in with twitter chats within the blogging community. Annoyingly, some of the great chats are fairly late at night which is rather frustrating and I'd say this has had a mixed effect on my mental health. I definitely feel like I'm a lot healthier mentally when I go to sleep earlier and I'm sure the late nights are not doing me any favours! Do you stay up late to join in and get yourself out there or do you go to sleep? I'd try and pick both! How has the blogging community effected your mental health? 100% agree that the blogging community is a great help! I do think that it can be very clicky and I have definitely found myself awake way too late to keep up with conversations, posts and stuff! Loved this post!